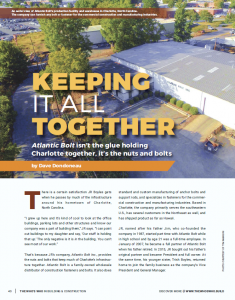 Atlantic Bolt specializes in all types of concrete anchors: F1554 Straight and L-Shaped anchor bolts, Wedge Anchors, Sleeve Anchors, Epoxy anchors, Titen HD, Headed Weld Studs, and more. 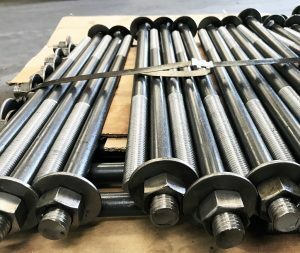 We sell a variety of anchor bolts, and we can make custom F1554 anchor bolts to your specs, all discussed here. L shaped and Straight anchor bolts are poured into place in order to secure large structures like lightpoles or large steel building supports. 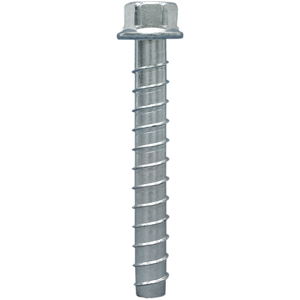 Most anchor bolts in this category are specified as ASTM F1554 grade 36, grade 55 or grade 105. L shaped bolts have long been the standard in this category, and we stock the most common sizes of bent anchor bolts. We can also make L-shaped anchor bolts to your specifications. In recent years, straight or “headed” anchor bolts have gained popularity because of their superior pull out resistance. These types of anchor bolts usually have a nut and or a washer (typically welded) on the embedded end. Straight anchor bolts are specified in a broad range of diameters and lengths, sometimes with plate washers welded. Other anchoring devices used in cured concrete actually fall into the category of expansion anchors, screw in, or epoxy/chemical anchors. When it is necessary to anchor material to cured concrete, these anchors are used and a predrilled hole is required. These types of concrete anchors utilize some type of friction mechanism to hold them in the concrete. Wedge anchors use a small wedge and are suited to solid, stable concrete. Sleeve anchors use a larger wedge that spreads the holding force over more area. For this reason they are used in concrete block, masonry, brick, mortar, or other, less solid concrete material. There are other, seldom used, types of expansion anchors, but they are rare in commercial construction and don’t warrant review here. A relatively new type of anchor bolt is the screw in type. These are basically large concrete screws, like Tapcons. Some common terms for these anchor bolts are wedge bolts, Titen anchors, high strength anchors, LDT or THD anchors. They are installed by drilling a pilot hole and driving in the screw/bolt. In some areas of the country, these anchor bolts are recognized as approved replacements or substitutes for cast in place anchor bolts in residential construction. Chemical anchors or epoxy anchors are the last form of anchor bolts we will discuss here. As the name suggests, these anchors use some type of epoxy to anchor threaded rods into the concrete. These anchors are used in cured concrete and sometimes in block locations. When cast in place anchor bolts have been set incorrectly, chemical anchors are widely used to solve the problem. 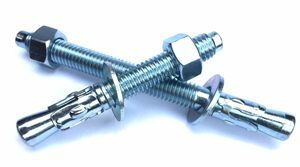 Whether you are looking for bent anchor bolts, headed anchor bolts, anchor bolts with plate washers, or any of the anchors mentioned above, Atlantic Bolt can help you.